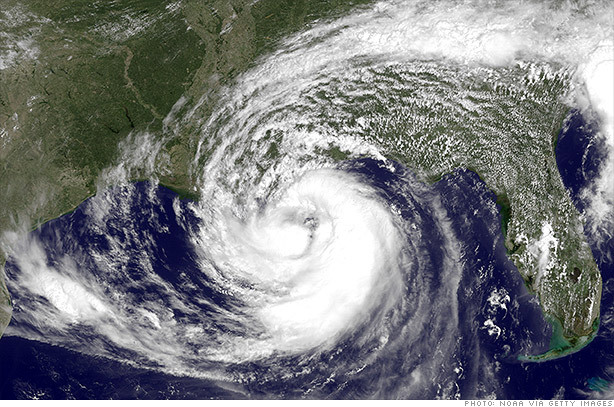 Wholesale gas prices eased Tuesday as concerns about Hurricane Isaac's impact on Gulf Coast refineries were tempered. The September futures contract for wholesale gasoline, known as RBOB, fell about 4 cents to 3.1075 per gallon. The decline came after wholesale gas prices surged nearly 8 cents Monday as then tropical storm Isaac veered toward the Gulf Coast, causing many oil refineries to shut down as a precaution. Wholesale gas prices were also supported as consumers along the Gulf Coast rushed to stock up in anticipation of possible shortages due to the storm, which was upgraded Tuesday afternoon to a Category 1 hurricane. However, analysts said the "panic buying" was over and that Isaac was unlikely to do lasting damage to oil refineries and infrastructure along the Gulf Coast. "People were buying gas like it was going out of style and wholesalers were bidding up prices ahead of the storm," said Phil Flynn, senior energy analyst Price Futures Group in Chicago. "But now it looks like the storm may not be as bad." Flynn warned that Isaac could still do "significant damage" if it develops into a Category 2 hurricane. "The market might be a bit over confident," he said. Despite the decline in wholesale prices, analysts said gas prices at the retail level may continue to rise for a few days. Wholesale gas prices can vary widely across the country based on local supply issues. In Chicago, for example, wholesale and retail gas prices have surged recently due to refinery outages in Indiana and a broken pipeline. The wholesale futures market is a "very flawed measure what is going to happen in the next 10 days," said Tom Kloza, chief oil analyst at the Oil Price Information Service. Kloza said retail gas prices will continue to rise over the next few days as the summer driving season winds down. But he said pump prices will probably fall once refiners are no longer required to produce the more expensive summer blends of gasoline on Sept. 15. "The bottom line here is that (the storm) is an act of God and nobody knows what will happen," said Kloza. Meanwhile, the recent rise in gas prices has sparked debate over a potential release of crude oil from the nation's strategic petroleum reserve, or SPR. The Obama administration is still considering a sale of oil from the SPR, although it is not planning any announcement, according to a White House spokesman. Analysts say tapping the reserves would be mainly a political move since refiners are generally well supplied with crude.